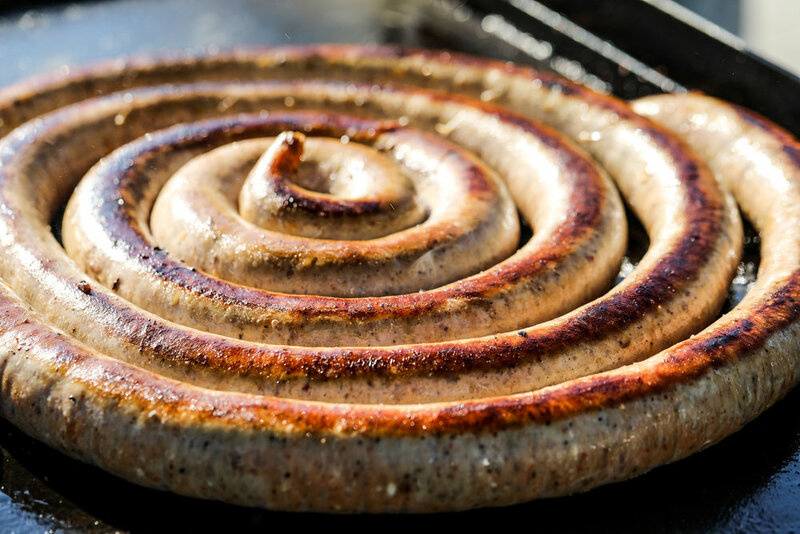 Is it just us, or does bombcyclone make you think of sausage rings? Is it just us, or does the #bombcyclone make you nostalgic for bonfires and summer days? ...This recipe makes it seem like bonfire cookout is not that far away. 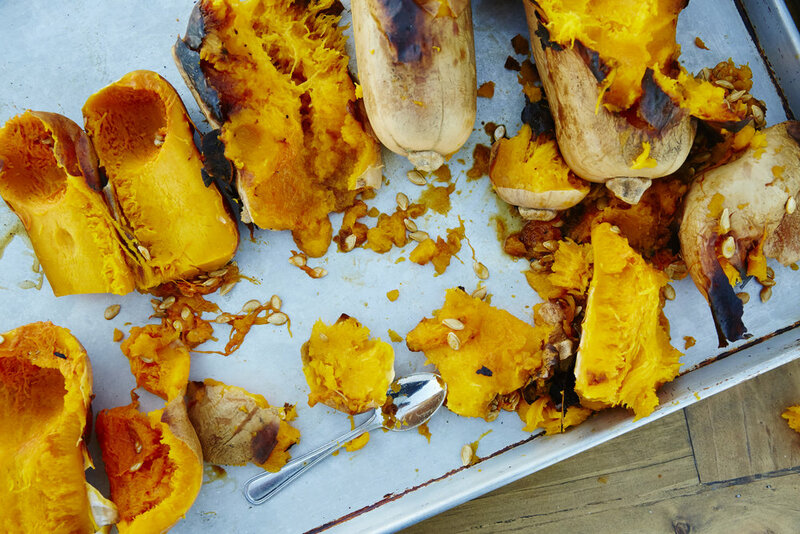 This dish is great for outdoor cooking, and the ingredients are easy to transport for a campout. That said, with a few adjustments, it's also deliciously cooked on a stovetop when the idea of braving the elements leaves a bit to be desired. On a VERY hot plancha, place peppers and onions without oil. May substitute and cook indoors on a stove top using a cast iron skillet like this fantastic one from Field Company or cast iron casserole dish like this one from KitchenAid. Allow onions and peppers to char by not agitating them, don't be scared if they burn a bit. Once charred well on one side, season liberally with salt and pepper, and then add oil. Move onions and peppers around until onions just start to turn translucent (approximately 10 minutes pending heat source). Remove from plancha and put aside. With fire at medium to high heat, place sausage on lightly oiled plancha and cook until seared on one side (pending size, may be 5-10 minutes). Once seared on one side, flip and “bury” underneath the reserved onions and peppers until fully cooked (another 5-10 minutes pending size). Serve as is, or in a toasted bun, covered in onions and peppers. 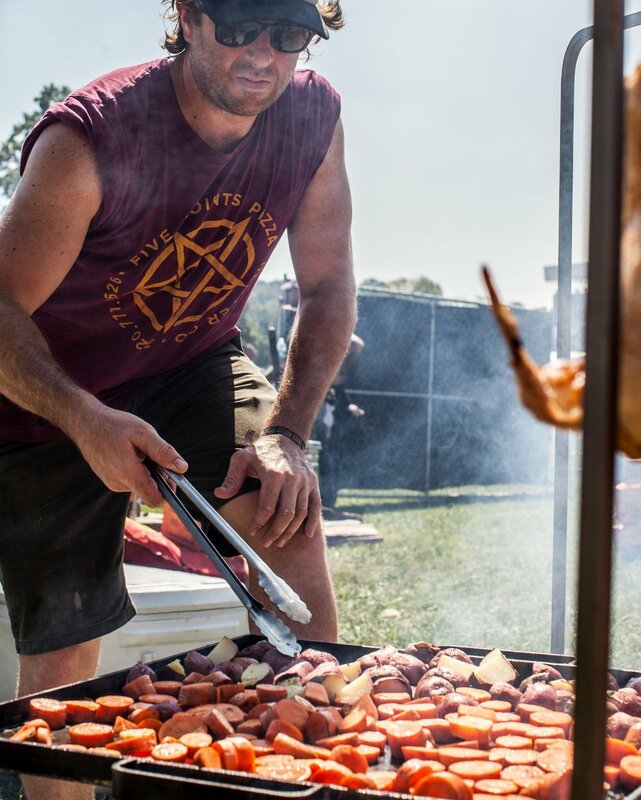 A sample of a plancha, as seen at Bourbon & Beyond with Love & Fire by bonfire cookout. When you're crafting desserts cooked on coals, sometimes it leads to rather odd dish names...the crobbler is the most recent testament to that fact. When deciding what to make for dessert last Fall, we all agreed a seasonal fruit casserole dish sounded delicious. The debate then became whether were we making a cobbler or a crisp. When we couldn't agree, and possibly fueled by a few bottles of wine, we landed on this Seasonal Berry "Crobbler". If the name takes off, we'll take our royalties in cast-iron. In a large bowl, toss the peaches and blueberries with the granulated sugar and lemon juice. Transfer the mixture to an 8x11-inch baking dish. In a food processor bowl, add the oats, flours, brown sugar, salt, butter, cinnamon, and nutmeg and pulse until the topping is crumbly. Sprinkle the topping over the fruit and place uncovered on the grill for 1 hour (grill temperature will affect actual cook time, so keep an eye on it). For a crispy topping, cover with a lid and add hot coals atop for 10-15minutes until the top is golden brown and the fruit is bubbling. Alternatively, if you have layers of coals, you can also place the casserole uncovered on the bottom for the same affect (e.g. if using a chapa grill). Let the crisp cool and serve with your choice of ice cream, whipped cream or creme anglaise.